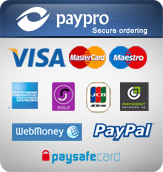 Your personal and financial information is securely processed by PayPro Global, our authorized reseller worldwide. PayProGlobal.com is a renowned electronic payment processing service that guarantees secure transfer and processing of your payment information. We accept transactions in all major currencies, and support all popular global and local types of payments. Your order is authorized instantly. PayPro Global will never share your financial information with any third party. Once you place an order, you will be sent a personal Unlock Key to activate your copy of software immediately. A copy of your Unlock Key will also be sent to you by e-mail automatically once your credit card is authorized. You are entitled for unlimited online technical support by email within one year of your original purchase. Your purchase gets you unlimited updates within the same major release, as well as makes you eligible for discounted upgrades. Our data recovery products are available on a "try-before-you-buy" basis. You can download and evaluate the free trial versions of our data recovery software before the purchase. Therefore, considering the nature of our data recovery products and its typical usage patterns and in accordance with the standards of service prevalent in media and software industries we are unable to offer refunds for software purchases. The exceptions may be provided by our company at our sole discretion. In compliance with local sales tax and VAT regulations, we may be obligated to collect VAT or sales tax from you depending on your jurisdiction. The correct amount of CAT or sales tax will be calculated at the time of your order.